Very peaceful mountain escape with all the amenities in a home away from home. This property has 3 nice sized bedrooms plus loft and sleeps 8 people comfortably. Come enjoy hiking, fishing, rafting, ziplining and sunshine during the summer, enjoy one of the fun Lincoln festivals or enjoy the comforts of the winter ski season! Bedroom 1: 1 King Bed, Bedroom 2: Queen bed Bedroom 3: 1 Twin over full Bunk bed Loft: Full sized futon can sleep 2. Master bedroom has its own full bath and there is a second full bathroom on the lower level. Bring the entire family! 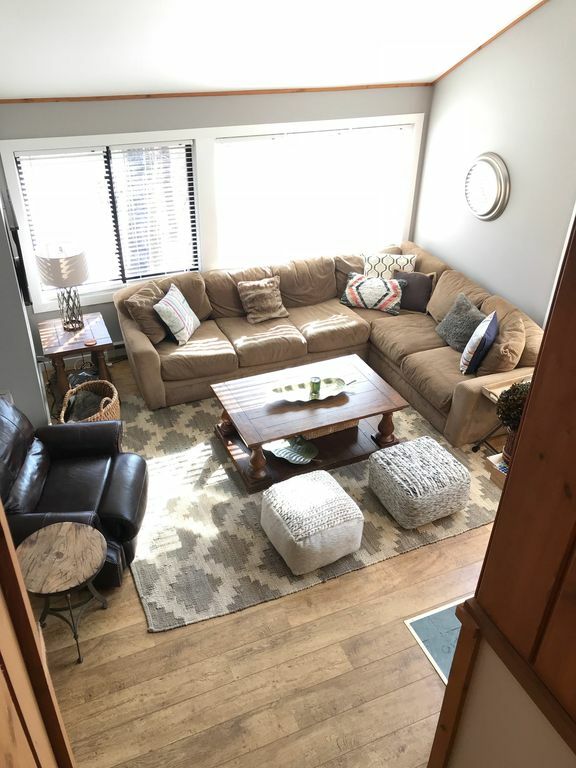 We have a large wrap around deck, seating for 6 at the dining table and 3 at the kitchen counter, a laundry room, mudroom, and a locked entry to store all your outdoor stuff! We also belong to the Village of Loon pool club and athletic center so you can use the gym, pool and hot tubs. All new bedding, sheets, towels and brand new living room furniture to make yourself at home! No pets or smoking allowed. Cozy yet spacious & well equipped unit! Tastefully decorated and well equipped unit for our party of 5 adults and 2 children. Kind and responsive owners. We plan on returning! We had a nice stay at Leslie's Condo. Our party consisted of 4 adults and 6 kids (age 5-13). While the complex is older, this unit has been updated nicely. Parking was right out front, as was the bus shuttle stop to Loon which we used 2 or 3 times, more as a novelty for the kids. I would stay here again, and also recommend it for those looking to stay in the Lincoln area. Kevin- Thanks for taking the time to review your stay. We are so glad you had a nice vacation and appreciate your family taking such good care of our home. Come back anytime! We had a wonderful time! The cabin was clean, well equipped and very comfortable. The location is just fabulous, easy to get to, close to town but no too close. We were a group of 4 adults and 4 young children (ages 3-7) and we felt the cabin was very safe for them so we could let them play without any concern. We got quick, friendly and efficient answers from the owner when we needed it, and we enjoyed ourselves thoroughly! I recommend this place for families looking for a great time! Excellent condo, plenty of room for a family of 5 to enjoy, could have easily fit 2 to 3 more people comfortably. Book it, you'll enjoy it !! Convenient location and all the amenities we needed for our family vacation! We explored Lincoln and all of the surrounding areas from this home and we had lots of fun (despite all the rain that we had). The place was very spacious and had all the amenities we needed to keep ourselves and our boys comfortable away from home. We visited the pool areas which were nice but slightly outdated. Our only complaint was how muggy it got in the house, which was tough with no AC, but plenty of fans were available to help keep it a bit cooler. All in all a good value for our money and we enjoyed our stay. What a wonderful stay we had. The owner was so nice a readily available to answer questions. So much space for 3 couples to relax and socialize. Beautiful living for entertaining. Also very close to everything. I would highly recommend a stay here! $175 cleaning fee with all rentals.